Clean silverware inexpensively with toothpaste. Believe it or not, toothpaste is one of the best and least expensive ways to clean silverware of that annoying tarnish that builds up over time. Silverware - whether sterling or sterling plate - generally responds the same way to a variety of tarnish removers, toothpaste included (namely, the tarnish is successfully removed). The only caveat to be aware of when using toothpaste is to be sure the paste is white in color, and is free of whitening additives or baking soda. Here's how to clean silverware with toothpaste. To begin, place a cotton sock on your polishing hand. Dampen the sock under cool running water. Squeeze out any excess water with your other hand. Squeeze a pearl-size drop of toothpaste onto the dampened sock at your fingertips. Using up-and-down (not circular) strokes, rub the toothpaste onto the front and back of silverware. To get the toothpaste between silverware tines and other tight spaces and grooves, pull the sock away from your fingers at the tips and twist tightly. Rinse the toothpaste from your silverware under cool running water. Remove the sock from your hand and set aside; grab and don its mate, and polish the silverware dry. Store silverware behind glass, in an airtight plastic bag, or in a chest lined with tarnish-resistant flannel. Resist the urge to bundle your silver in rubber bands: the rubber can cause discoloration on silverware. Avoid serving sulfur-containing foods such as mayonnaise and eggs from your silver platter - it's a recipe for instant tarnish. 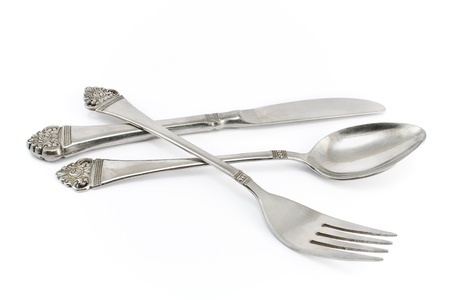 Avoid using rubber or latex gloves when cleaning silverware - both are corrosive to silver.